I wanted to make a Christmas pudding this Christmas but no one I know likes the taste! 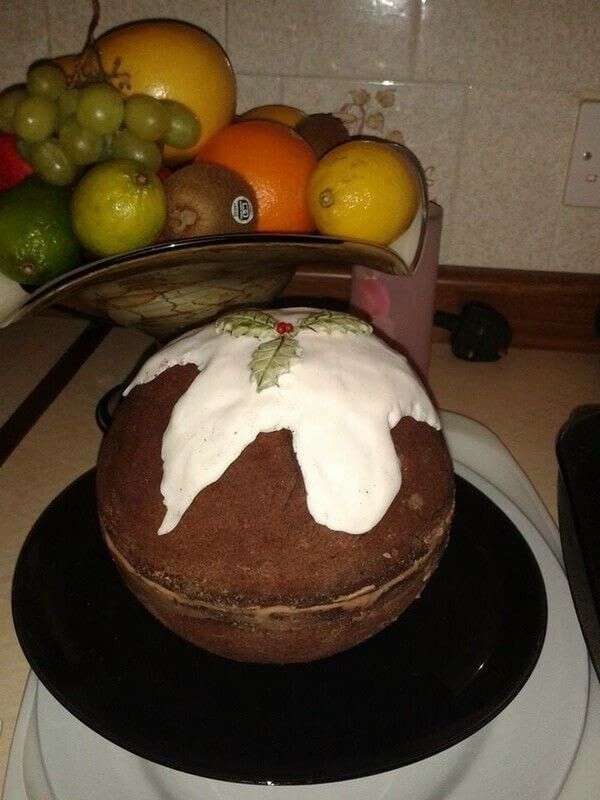 I found a similar Christmas pudding cake on the Lakeland website, this is my take on it. I used their medium hemisphere pans (so mine is a lot smaller than the one they made). Preheat the oven to 160°C/320°F. Grease 2 Medium (16cm) Hemisphere Cake Pans. Mix the butter and sugar together until light and fluffy. Beat in 4 eggs and half of the flour, then beat in the last 2 eggs, vanilla essence and remaining flour. Transfer the mixture to the tins and bake for 50-55 minutes. Leave to stand for 5 minutes then transfer to a cooling rack. Add the brown food colouring to the buttercream. Spread the flat edge with the jam and most of the buttercream (you will need some left over to stick the icing on) and put the two cake halves together. Roll out the white icing and cut into a ‘puddle’ shape, lay over the top of the cake so you’re happy with the size and placement. Stick on with the left over buttercream and smooth down. Cut out the holly leaves from the white rolling icing and tint green. Roll two small balls and tint red for the berries. Stick the holly leaves and berries to the ‘puddle’ shape with a little water.